Workhorse premium ultrasound systems seek to improve workflow, ease-of-use, and ergonomics, but their key objective is to help clinicians answer more diagnostic questions. Following what's "trending" in premium ultrasound systems isn't as simple as checking Twitter feeds for relevant hashtags. By interacting with clinicians and facility administrators, industry professionals are finding a variety of trends in the marketplace—workflow, ease-of-use and ergonomics to name a few—joining with an overreaching desire to enhance diagnostics. "You could ask 10 people in the industry what the trends are in premium ultrasound right now and get different answers from each person," says Glen McLaughlin, PhD, founder and president of ZONARE Medical Systems. 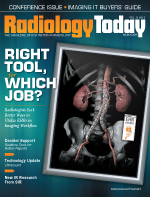 "In general, radiologists are looking for an all-encompassing ultrasound machine that combines the functionality of all other ultrasound devices but is more cost-effective." Image quality tops every list, particularly when it comes to increased use of ultrasound in the process of determining levels of disease. "Diagnostic confidence is the number one trend I see," says Brian McEathron, general manager of general imaging ultrasound for GE Healthcare. "The performance of the machine and improved image quality are important to gaining that level of confidence. And with ultrasound, the technology advances over time, allowing you to extract more information and develop more uses." When it comes to specifics, McLaughlin says users are working with existing systems to meet needs driven by things like developments in managed health care and evidence-based medicine. However, they're not always explicit about the functionality they're looking for. "They're not coming to us with their problems and asking for us to fix them," McLaughlin says. "They create workarounds for any problems they're having, using the tools they have available to them. It's our responsibility to observe customers, to see what their clinical needs are, and then address them. We can help our customers see how to do better." McLaughlin sees trends in developing ultrasound devices that focus on improving ways to diagnose disease and address other medical issues, particularly in patients who, from the sonographer's perspective, present greater technological challenges. "We're seeing a growing trend in obesity in the population," McLaughlin says. "With that comes an increased need to address the more challenging patients. Some lower-level devices just can't image these more challenging patients and we can't get a good diagnosis and provide the proper treatment." Current developments in managed health care and the examination of the overall costs associated with patient condition monitoring is driving a trend toward more quantitative evaluation of patient conditions with ultrasound. For example, McLaughlin says that with growing numbers of patients with liver disease in the United States, there is a corresponding increase in liver biopsies. He says that a patient with liver disease typically undergoes a biopsy every six months to monitor liver fibrosis levels. "This disconcerting procedure brings with it the possibility of infection and other collateral damage," McLaughlin says. With ultrasound elastography, however, doctors can order a noninvasive imaging modality that measures firmness to help assess lesions and disease in tissue to gather quantitative information regarding the state of disease or tumor development. Elasticity imaging techniques track the elastic properties of soft tissue, measuring the tissue's mechanical properties. The main idea is that tissue hardness or softness will provide diagnostic information about the presence or status of disease, acting like a virtual biopsy. Cancerous tumors are harder than the surrounding tissue; diseased livers are stiffer than healthy ones. "There seems to be a push toward more quantitative evaluations, looking at measurements of stiffness and attenuation," McLaughlin says. "You're going to see platforms in the near future that will give you an evaluation of the underlying tissue. "With a biopsy, there's always the question of whether you're sticking the needle in the right place," he says. "There's a feeling that we need information beyond the qualitative aspects—that we also need quantitative information. We're looking for a better level of specificity." Other industry executives see an evolution of ultrasound from a diagnostic tool to functionality as an interventional device. "To go from diagnosis to intervention you need good imaging," says Nancy Plambeck, senior strategic development manager for ultrasound with Toshiba. "Doctors want to be able to easily take their patients to the next level, so if the imaging shows there's a need for intervention they should be able to address that immediately." Another driving factor in the trend toward interventional ultrasound is the desire to reduce radiation exposure, according to Andy Milkowski, senior director of research and development, Siemens Healthcare ultrasound. "There is pressure in the industry to reduce radiation exposure," he says. "This has caused a move to 'fuse' real time ultrasound images with prior CT or MR images." In other trends, McLaughlin says the industry is considering more combined imaging exams. "This will wreak havoc with reimbursement but will happen despite that," McLaughlin says. "While the cost of health care is a significant burden we have to do something different." Jeff Cohen, business segment leader for general imaging with Philips Ultrasound, also sees a trend toward interconnectivity of modalities, particularly in relation to the challenges involved with cancer care. Incorporating multiple medical specialties—radiology, oncology, and surgery—is a key to cancer diagnosis and treatment, but with that there can be a need for incorporating multiple imaging modalities. "With CT scans you can gather structural data," Cohen says. "When you combine that with the soft-tissue data from ultrasound you get the best view of what's going on with the patient's cancer, which leads to the best diagnosis, all in one setting." Multimodality interconnectivity also feeds into trends in EHRs and PACS, he says. The seamless sharing of data through electronic systems creates an "ecosystem" within institutions and enhances problem-solving, diagnostics, and treatment methods. Cost savings from built-in capacity to upgrade is important to facility administrators when considering a premium ultrasound system, whether that expandability is through add-on devices or software upgrades that increase functionality. "People are looking for that one expert tool that they can upgrade and have grow with them," McEathron says. "They want a platform for the future that they can build upon." In other instances, clinicians are looking for customization features to achieve cost savings. "Sonographers want to maintain control over how they collect images," Milkowski says. "Radiologists want to see images in a particular order and format, regardless of who the sonographer is. There is a need for features that bring productivity to an entire department." From a user perspective, efficiency is another trend manufactures are working into their products. Increased pressures related to health care costs are resulting in increased pressures on facilities to be more productive, and with increased pressure on budgets there is an increased cost of ownership. "Hospitals are looking to do more with less and with that are making cost-driven decisions," McEathron says. "They're looking for improvements in efficiency, ease-of-use, and ergonomics." Plambeck says hospitals also often look to improved workflow, and the cost savings it can bring, when considering new ultrasound equipment. As a former sonographer, she knows the challenge in making changes to workflow comes in trying to provide consistency in both patient experience and in image quality. "Workflow can be impacted when you're working with patients of different sizes, for example," Plambeck says. "Users want consistency in the continuum of care, and to even provide specialized care when necessary. As product developers, these are the types of things we need to address for our customers." While a sonographer-specific trend such as ergonomics might sound one sided, product developers note how user comfort also leads to image quality. The Carestream Touch Ultrasound System, introduced at RSNA and expected to be available commercially in the third quarter of 2015, includes an all-touch control panel with markings for primary controls etched into the screen. "While considering image quality, the focus with the touchscreen is on the user experience," says Daniel Monaghan, Carestream's regional business manager for ultrasound. "We know that 80% of all sonographers scan in pain, so with that knowledge, how do we help users meet the high standard of image quality while also paying attention to their needs?" Monaghan says that the user experience is important to consider when developing new ultrasound products. Sonographers spend about 45 minutes with each patient, so making that experience more efficient for the user will, in turn, aid in improving the patient experience. This approach also leads to more consistency in imaging, he says. "The sonographer plays a vital role in the diagnostic process and how great the technology can be," Monaghan says. Turning to customers for insight regarding direction for advancements in premium ultrasound is a good way to gauge where to focus development. Cohen notes that it's important to incorporate the needs of all customers, both clinicians and administrators. For example, some facilities are looking to establish specific liver cancer centers. Both clinicians and administrators want to incorporate innovative technology while understanding what it takes to come up with a confident diagnosis. "When considering premium ultrasound needs, clinicians look at the user aspects while c-suite executives consider the economics," Cohen says. "The key trend is how do we provide the best image quality, and that's valuable to clinicians and administrators. They want no variability between exams as well as from patient-to-patient. They're looking at time-saving features. And they want to reduce recall rates." Continued advancements in ultrasound include where else the technology can be useful as a cost-effective diagnostic tool. Areas such as hepatology, gastroenterology, and thyroid disease could benefit from ultrasound, particularly with contrast. However, contrast ultrasound is not yet approved for use in the United States. "The challenge is that standards that exist now don't call for ultrasound," Cohen says. "For example, with prostate cancer, ultrasound with contrast could be a better solution but there's not enough evidence yet to show that. That's where you find the importance of becoming involved in more clinical trials." While the industry continues to develop and patients can benefit from specialized ultrasound devices, Cohen sees ultrasound returning to more "mainstream" uses. "We can still make premium ultrasound devices that are easy to use and yet still capable of handling challenging patients and situations," Cohen says. "There will still be a need for specialized systems but it's important that they tie back into the premium system. We're still developing premium systems with as much functionality and operability as possible."